I love this recipe! It gets five stars because, made as directed, it's absolutely delicious; creamy, savory and just perfect. If I could give this recipe more stars, I would, because it's also extremely flexible. 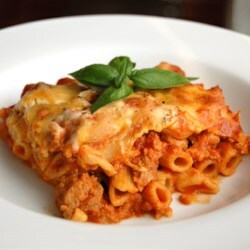 I've made this with Italian sausage or ground turkey instead of the beef. I've also made a vegetarian version by substituting sliced zucchini and mushrooms for the meat. Sometimes I add chopped garlic and fennel seed. (There's something about fennel seed that, to me, is integral to Italian cooking. It's like cilantro to Mexican food.) Obviously, the key to the greatness of this recipe is the substitution of a layer of sour cream and provolone for the usual ricotta. That's what makes the dish so moist and creamy. Who hasn't make a beautiful lasagna only to have it dry out in the oven? I like ricotta as much as the next Italian-American, but the stuff is pretty dry and really adds no flavor. It's essentially just a binder. Here, the combination of the provolone melting into the sour cream is truly inspired; the sour cream adds moisture and the provolone adds flavor. I'm planning to use the same combo instead of ricotta in my next lasagna. The importance of using a high-quality sauce for this recipe almost goes without saying, so I'll stop here. Thanks, Colleen!